Children love to explore the world with all their senses. Therefore, sensory play activities offer valuable learning experiences for children. They use the sensory information they acquire through play, to make sense of the world around them. The sound, sight, touch, smell and taste of things children experience, builds neural pathways in their brains enhancing their development. Sensory information allows children to build cognitive skills and motor skills. It increases language development and encourages social interaction and problem solving. With so many benefits, I believe it is important to create sensory play environments for children at home. 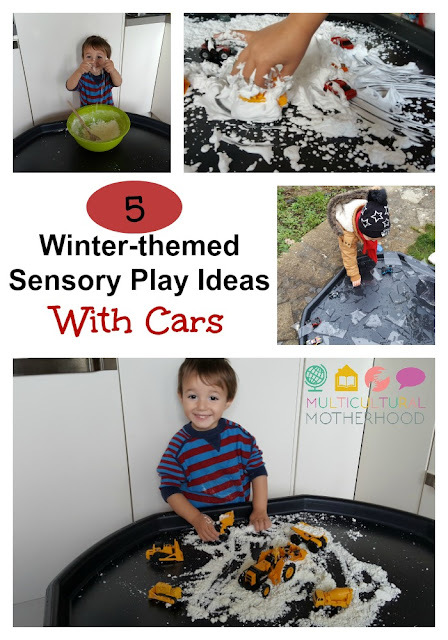 As it is winter, I thought it would be good to set up some winter-themed sensory play activities for my toddler. His obsession with vehicles led me to incorporate them into these 5 sensory play ideas. I started our winter-themed sensory fun by making some snow dough. Living in the UK, we rarely get any snow. If you are also devoid of snow this season, the next best thing is to make your own. Snow dough is easy to make, simply mix 2 cups of cornflour (cornstarch) to 1/3 cup of oil. K had a lot of fun helping me make this - he loves stirring at the moment! 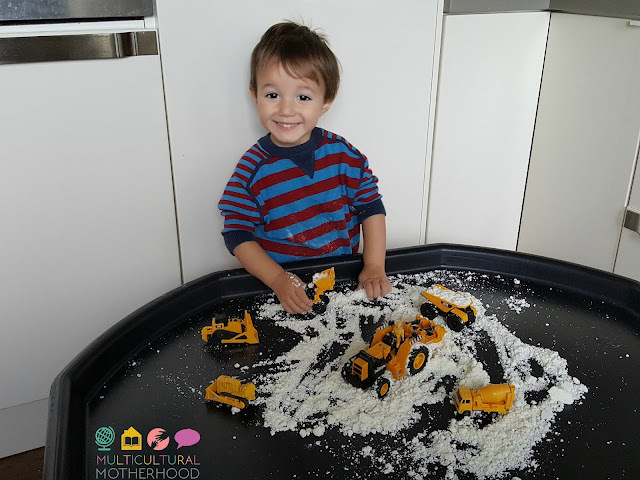 We tipped it out on to the tuff tray which is the perfect base for your sensory play activities because it keeps everything contained. Next, I added some construction vehicles for K to use with the snow dough. He loved it! This activity kept him occupied for well over an hour which is pretty impressive for a toddler with a short attention span. I kept the snow dough in a tub and used it a few more times over the next few weeks. 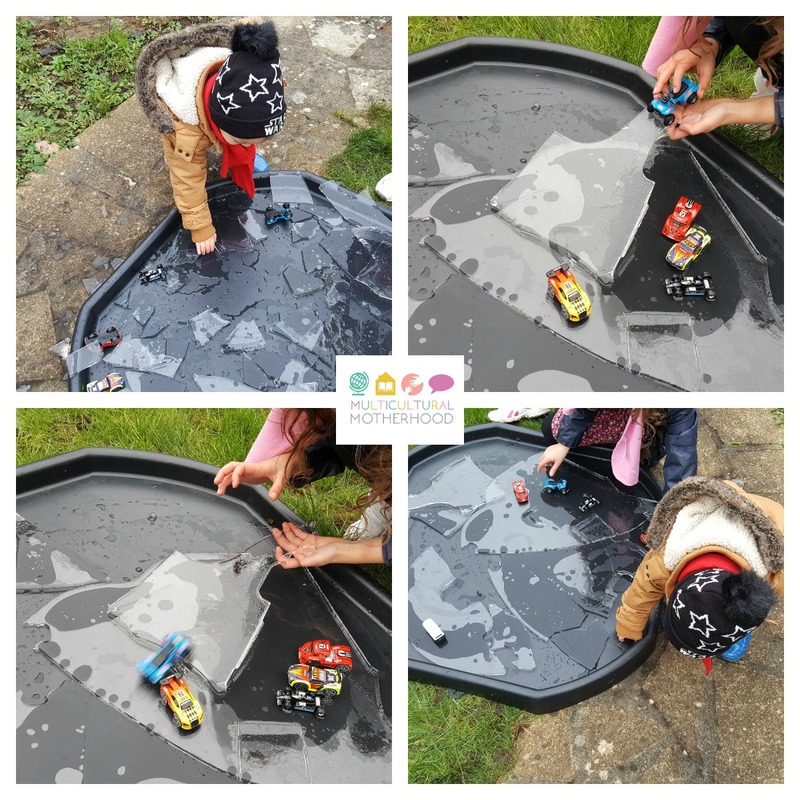 As it has been so cold over the last few weeks I had the idea to use ice in our sensory play. I left the tuff tray outside overnight with a thin layer of water covering the bottom in the hope it would freeze. Unfortunately, it did not! But do not let that put you off, if you live in colder climes it is well worth a try. Luckily, I found some ice around the garden and placed it carefully into the tuff tray. Then I added some vehicles. I dressed the children up warm and out they went into the garden. It is so important to let the children play outside even at this time of year. It was interesting to see how the cars moved differently on the ice compared to the normal tuff tray surface. Before long, the children were breaking up the sheets of ice and exploring them in different ways. My daughter made one shard of ice into a ramp and dropped cars down it eagerly watching how fast they went. The children had great fun with the ice and particularly enjoyed smashing it to pieces at the end. To my surprise, we did have one day of snow during the month of December so I quickly took the opportunity to use some for our sensory play. There was only a thin scattering on the ground but I managed to scoop enough up for some fun on the tuff tray. 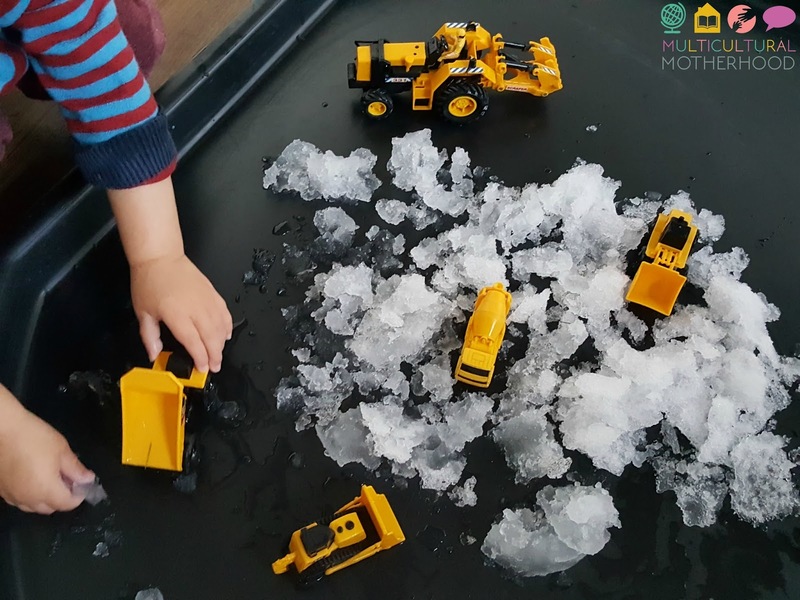 I gave some construction vehicles to K and he enjoyed scooping up the snow, as well as ploughing through it. It was a great opportunity for him to experience the feel of snow and discover it's texture and temperature. However, this activity did not last too long indoors as the snow soon melted. If you attempt this activity indoors, you need to be quick! Our final attempt at creating snow came with the use of some shaving foam. 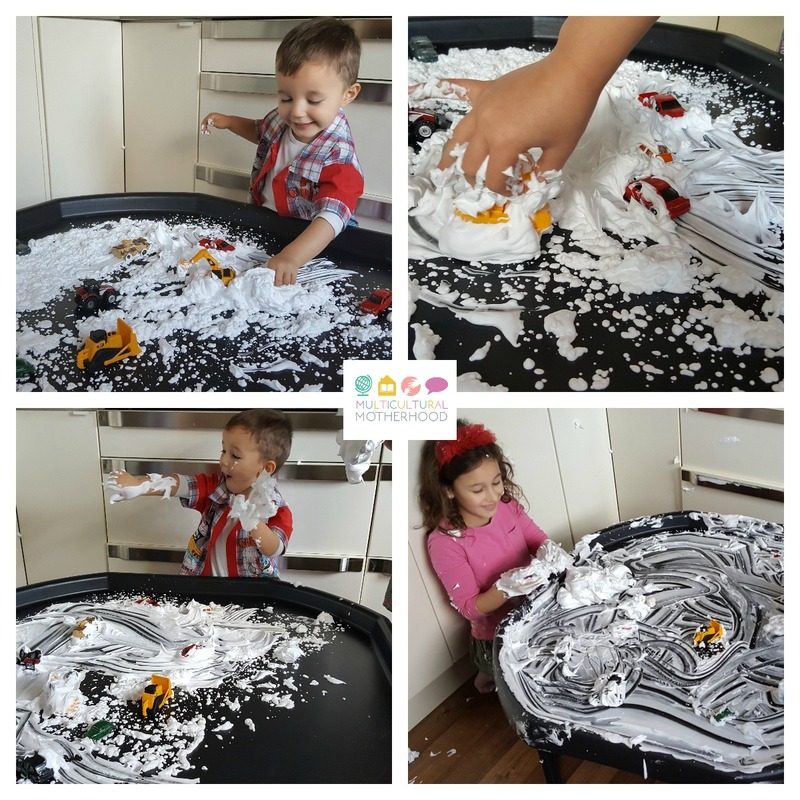 This sensory play activity attracted the older children as well as the toddler. They all enjoyed exploring the foam and it engaged all their senses. 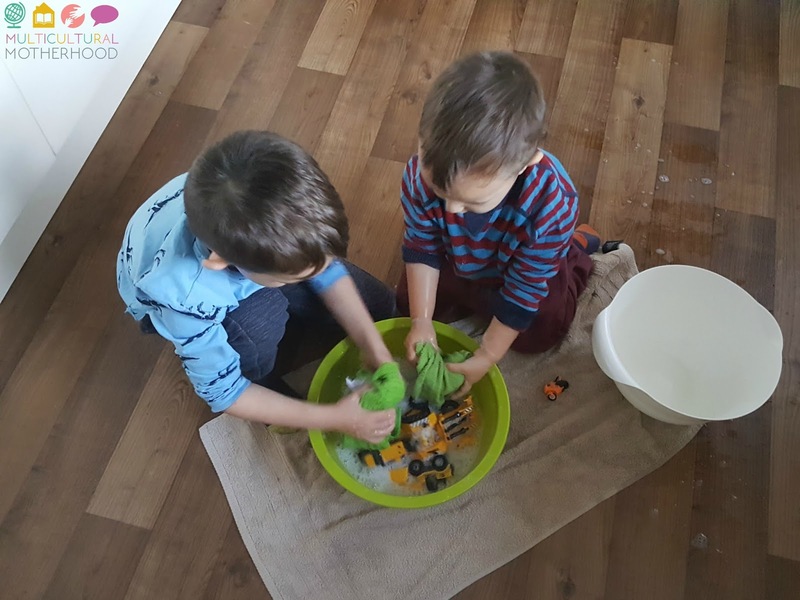 They played with the cars in the shaving foam for some time but it was slightly messy with foam flying around the kitchen. However, I did not find it too difficult to clean afterwards and the children helped me with this. Finally, after play is over it is time to wash up. 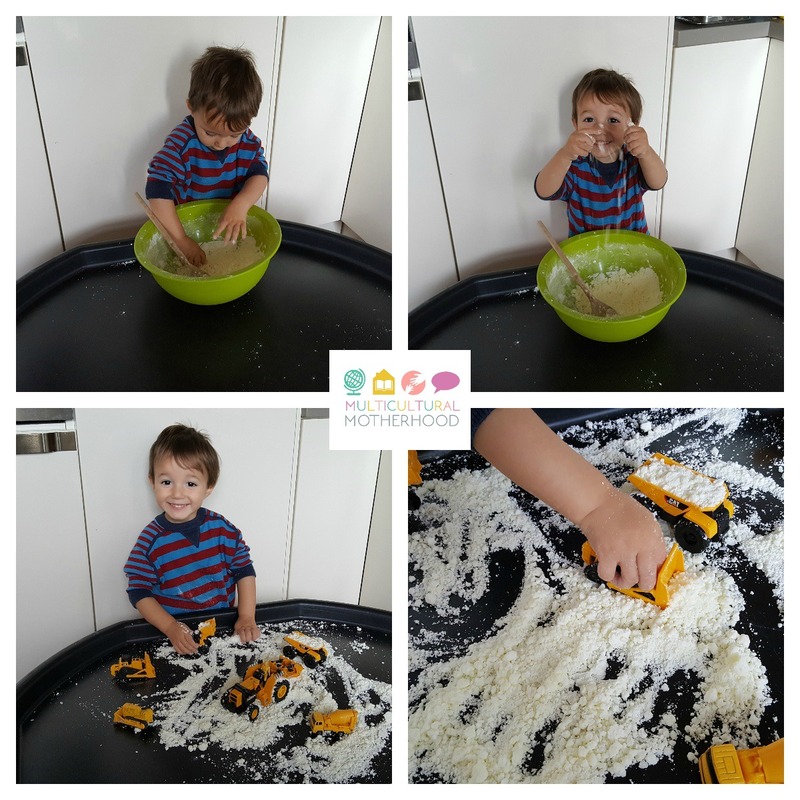 This is a sensory play activity in itself and the children love it! Give them a bowl with some water and a few wash cloths and let them get on with it. Happy children and happy mum! Do your children enjoy sensory play? Which activities are their favourites?